Mikania (Mikania micrantha) is an exotic perennial herbaceous vine belonging to the family Asteraceae (Compositae). It is originated from tropical South and Central America but is now widely distributed in India, Southeast Asia, Pacific islands and South China including Guangdong and Hong Kong. 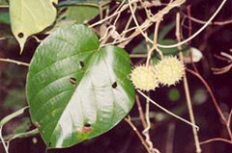 Similar to the habit of other climbers, Mikania climbs up other plants to reach the canopy for better sunlight. Even worse, its leaves grow vigorously and will cover up other plants eventually causing damage or even killing other plants by cutting out the light for photosynthesis and smothering them. 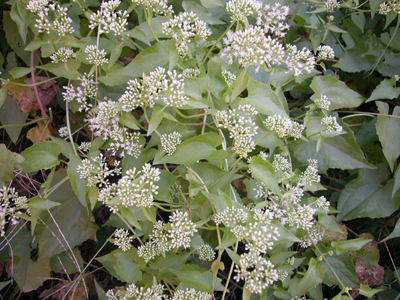 Mikania sprawls out rapidly in spring and summer which is the reason for its name “mile-a-minute weed”. Moreover, it reproduces efficiently both sexually by seeds, and vegetatively by rooting at nodes. Mikania has characteristic opposite, heart-shaped leaves, margins irregularly coarsely toothed, 3 - 13cm long. Mikania has much branched and hairless stems, and numerous small heads of densely clustered white flowers with fragrant. 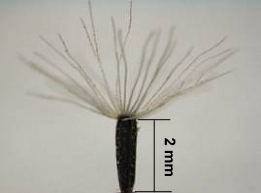 Mikania produces small seeds, black in colour, with a terminal tuft of white bristles for wind dispersal. The first record of Mikania in Hong Kong dates back to 1884 but the plant has only become a weed in recent years. It is now usually found in low-lying, moist and disturbed areas with ample sunlight such as derelict fields, fishpond bund, roadside, and woodland edge around village environs. In Hong Kong, Mikania starts flowering in September and sets fruits from November to February the next year. It produces numerous flowers and a huge amount of seeds with a very high germination rate. These properties are attributable to the high spreading rate of Mikania. Inadequate sunlight will suppress the fruiting, seed germination and growth of Mikania. As such, it does not grow well in shaded environment and therefore has not caused significant adverse impact on established woodland and plantations. However, there have been signs of spreading of Mikania in Hong Kong, especially in the abandoned farmland possibly due to the decline of agricultural activities in recent decades. Moreover, woodland edge, roadside areas and disturbed areas after construction projects are also susceptible to invasion of Mikania. There is growing concern about the potential impact of Mikania to natural vegetation. Clearing Mikania with physical means (e.g. cleared manually by slashing it with hand tools or mechanically by using a brushcutter) is currently the usual practice in Hong Kong. The stem of Mikania is cut off as close to the ground as possible and the aerial part removed and disposed of properly. For those which hang on trees, the aerial part could be cleared up to about 3 metres from the ground while the rest will wither and die off naturally. However, there may be regrowth from the bases and repeated clearing should be applied as and when necessary. As Mikania may grow from slashed stem fragments and regrowth from base is rapid, chemical control with systemic herbicide seems to be more effective in controlling the species as it could kill the entire plants. 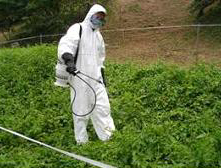 Mikania is susceptible to many herbicides such as glyphosate and Sulfometuron-methyl. However, application of herbicide is not suitable for sites near water sources, active agricultural land, gardens and residential areas. Moreover, after the application, Mikania and other vegetation in the treated area would wither altogether which could be unsightly for a period of time. Biological control has been considered as the ultimate solution to control invasive species as its action is supposed to be long-lasting and specific which does not adversely affect other non-target species. 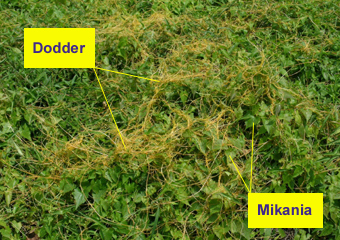 Researches have been carried out in different countries to explore effective biological control agents for Mikania control, such as the arthropod which naturally feed on Mikania specifically, the rust pathogen that is damaging to Mikania or the dodder which controls the growth of Mikania by parasitic action. However, no conclusive result in field application is available at this stage. Controversial issues such as the cost and benefit of the method and the potential side effects of biological control agent have yet to be resolved. A holistic approach in controlling Mikania through habitat management is under trial at certain sites in Hong Kong. As Mikania has a lower germination rate and growth rate in shaded environment, planting trees and shrubs at infested sites after clearance of Mikania could theoretically provide the shaded environment to suppress the weed from regenerating at the sites. Preliminary field observations showed that the regeneration of Mikania at such sites was much reduced after establishment of the plantings. However, intensive maintenance work such as the use of weed mats and frequent weeding was invested in the initial period to control the regeneration of Mikania so as to ensure the healthy growth of the plantings. Considering the resources implication and other site constraints, this approach has only been applied at certain ecologically important sites. As a general rule, AFCD is responsible for clearing of Mikania inside Country Parks and Special Areas. Highways Department (HyD) is responsible for clearing of Mikania along expressway and on SIMAR under HyD maintenance. The Leisure and Cultural Services Department is responsible for clearing Mikania in public parks, open spaces and along public roads. Clearing of Mikania on unallocated and unleased government land not maintained by other government departments is under the jurisdiction of respective District Lands Offices. The Development Bureau Technical Circular (Works) No. 6/2015 on “Maintenance of Vegetation and Hard Landscape Features” defines the division of labour amongst various government departments on maintenance of vegetation. The government does not have the right to enter private lands to clear Mikania therein. As a matter of principle, owners of private lands should be responsible for maintaining vegetation on their properties and request for clearing Mikania on private land would not be carried out by government departments under normal circumstances. Upon receipt of enquires or complaints on Mikania related issues, a site visit would normally be required to confirm the species of climbing plant of concern and to assess the habitat and vegetation affected. Particular attention should be paid to the climbing plant in question as it could be our native species such as Climbing Bauhinia (Bauhinia glauca) and Spiny-fruited Vine (Byttneria aspera) which commonly occur in Hong Kong as part of our biodiversity. 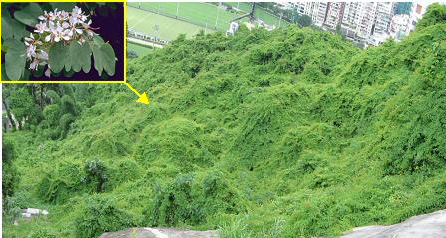 In such cases, it is not desirable to clear the climbers which would cause unnecessary disturbance to the natural vegetation cover and may even create a niche for Mikania to invade. 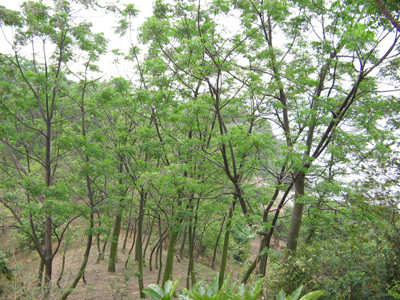 At the time being, it would be impossible to eradicate Mikania completely in Hong Kong, as it has already taken root in many locations. When considering a request for clearing Mikania, one should firstly assess the priority according to the impacts on vegetation and landuse of the site in question. In general, priority should be given to control the spreading of Mikania at ecologically important areas such as Country Parks and Special Areas and to clear Mikania where mature trees and woodland habitat have been adversely affected. On the contrary, removal of Mikania on derelict fields or disturbed sites may not be justified unless the situation is very unsightly causing public concerns. Site accessibility should also be duly considered as some sites affected by Mikania are on difficult terrains or at remote areas where access would be impracticable. AFCD conducts regular monitoring in Country Parks and Special Areas and would remove Mikania to prevent spreading of this weed in these areas as far as practicable. Other concerned departments would arrange clearing of Mikania affecting the natural vegetation and landscape features in areas under their jurisdictions where warranted. Landowners and management agents of private housing estates should be responsible for the locations within their properties. Various departments or concerned parties may appoint landscape contractors, skilled landscape workers or gardeners to clear Mikania in areas under their jurisdictions. AFCD has also prepared a Practice Note [This link will open in a new windowEng] / [Chi] on clearing Mikania for interested parties for general reference. In principle, the best way to protect woodland and trees from damage by Mikania is to monitor the situation with regular maintenance to control its spreading. Depending on the intended landuse of the site in question, planting trees and shrubs at the site may be considered as a long-term measure to control Mikania. In addition, disturbance and fragmentation on natural woodland should be avoided as far as possible in order not to create woodland edges which are susceptible to Mikania invasion.